When George Bailey first appears in the Christmas classic, It's a Wonderful Life, he and a bunch of other boys are sliding down a snowy hill on their snow shovels (their parents presumably couldn't afford sleds or toboggans). That's about the only fun use to which snow shovels have ever been put. Snow pushers would seem, at first glance, to be a wonderful alternative for people with bad backs. With their wide, curved blades, snow pushers act like human-powered plows. Although you can toss snow with them in a pinch, that's not really what they are designed for: The shape of their blades makes lifting and flinging snow with them somewhat more difficult. Instead, as their name suggests, the idea with snow pushers is to push the snow out of the way. But those of you who live in regions with minimal snowfall may be interested in the Penguin VersaGrip snow pusher. The plastic (poly) blade is 24 inches wide X 11.5 inches long and its edge is protected by a steel wear strip. Durability is further enhanced by a steel core shaft. But it's the wide-grip handle of the product that gives the VersaGrip its name. The handle of this snow pusher is designed so as to accommodate two gloved hands and a variety of grips, thereby relieving strain on the hands and wrists. If you have no use for snow pushers but do find the wide-grip handle of the VersaGrip appealing (whether for health reasons or otherwise), you may be interested in another Ames True Temper product: the Snow Blazer. It boasts the same unusually-shaped handle as the VersaGrip, along with the same steel core shaft. The blade is also plastic and protected by a steel wear strip. But the blade on the Snow Blazer is 19 inches wide X 13.5 inches long, giving it the shape of the more typical snow shovel. However, it differs from the common flat-blade products in that the sides and back are taller, creating more of a "scoop." Because of its scoop-like blade, the Snow Blazer could double as a snow pusher in a pinch. Yet it's still easy to toss Old Man Winter's refuse with it. Think of the Snow Blazer as a nice compromise between snow pushers and standard snow shovels. The Avalanche Ergo Plus ergonomic snow shovel is a much different product, despite also having a plastic blade with more of a "scoop" than do flat-blade products. Yes, the Avalanche is one of those funny ergonomic snow shovels with the bent shaft. The edge of the Avalanche's blade is protected not by steel, but by a nylon wear strip so that you can shovel snow off decks without worrying about damaging the wood. Even if you don't have a deck, the wear strip will at least extend the life of the blade a bit. Of course, you will wear down the wear strip in no time if you try to break the ice with these snow shovels. On the subject of breaking ice, here is a little secret. Despite the skepticism one hears about breaking ice with plastic snow shovels, some people report having done it occasionally for many years (with the same shovel) without experiencing much breakage (on the snow shovels, that is, not the ice). If you'd rather not chance it, though, just use ice melt products or ice-choppers as alternatives. Incidentally, aluminum blades with steel wear strips are not much better than plastic blades with nylon wear strips in this regard, despite metal's reputation for toughness (see below). But first and foremost, these ergonomic snow shovels are about ease of use—and avoiding back injuries. No steel core shaft here: This ergonomic snow shovel has an aluminum shaft, making it as light as possible. 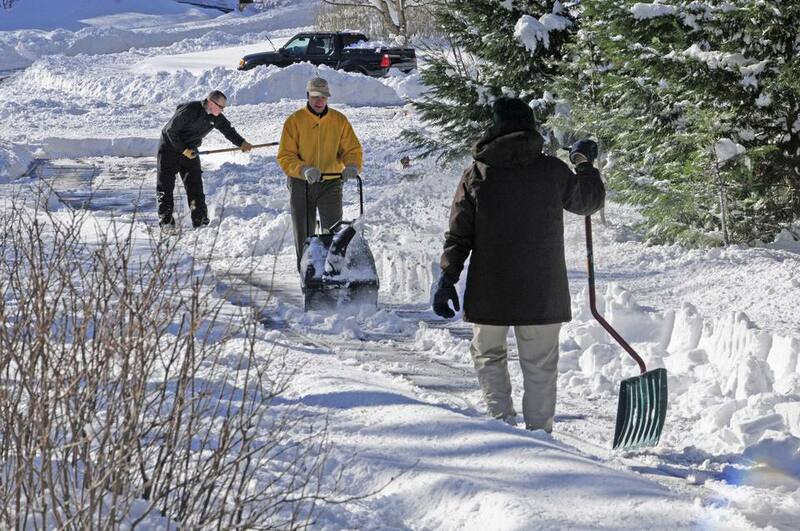 Reducing the weight of a snow shovel is one way to minimize the stress that shoveling imposes on your back. More importantly, the bent shaft is supposed to allow you to keep your back straight while shoveling, as you can get a good grip on the shaft without having to reach down too far. Nonetheless, when shopping for such ergonomic snow shovels, pick them up first and go through the motions of shoveling, to see if they're the right length for you. The one tested for this review wasn't quite long enough for someone 6 feet tall, meaning the temptation on the part of the reviewer to bend his back was still there—thus defeating the purpose behind the ergonomic design. If you truly dislike plastic blades and seek an alternative that's still lightweight, another Ames True Temper ergonomic snow shovel (although sometimes advertised as a "snow pusher," it's really a snow shovel), the Aluminum Ergo Arctic Blast, does bear an aluminum blade. Or maybe you are not sold on the idea of using bent ergonomic snow shovel? If not, continue reading, because a review is provided, below, of a "regular" snow shovel. Ames True Temper Arctic Blast aluminum snow shovels are not durable products. That is, these aluminum products will not tolerate abuse. If you are able to recognize that fact, accept it, and treat the equipment accordingly (that is, with "kid gloves"), you will find it a passable product. However, one hopes for more out of a metal unit. Sure, these aluminum snow shovels are light-weight. But one can get that from a plastic unit. During mild winters, you might prefer to use the Ames True Temper product reviewed above: namely, the Avalanche. Hard winters are another story, though (see below). It has the usual advantages of aluminum units over plastic ones: cutting through the packed snow. Even light ice chopping is out of the question with the Ames Arctic Blast. The plastic handles are of questionable durability. The handle is advertised as "oversized" to accommodate a gloved hand, although its size strikes one as fitting the current norm. The blade, advertised as being 18 inches, is actually 17.5 inches wide. The blade's wear strip is made of steel. Before continuing this review of Ames' aluminum snow shovels, some defining of terms is in order. The blade is generally attached to the shaft by means of rivets, mainly. Likewise, the wear strip is held to the blade with rivets. Note that many use the word "handle" to refer to the shaft, which introduces ambiguity into the discussion. Our hold on the shaft of a snow shovel is, indeed, just as critical to the act of shoveling as our hold on the grip; therefore, the shaft does function as something of a "handle." But to avoid confusion, it's necessary to distinguish between these separate components. While Ames boasts that the plastic handle on this product is durable, other reviewers have challenged the claim. And while the present viewer hasn't owned his aluminum snow shovel long enough either to corroborate or contradict that challenge, he notes that what he saw at the store (where he bought it) wasn't reassuring. For in the bin at Home Depot where the unit was purchased, the handle on one of the other aluminum snow shovels was already broken. To add insult to injury, another issue was noticed with the blades of some of the units in the bin: Their rivets were rusty. If these were used aluminum snow shovels, Home Depot had not marked them as such. And perhaps the rust would do no harm, as the product would probably have to be replaced on other grounds long before the rust amounted to anything. Still, the fact is worth noting. Of much greater significance is the fact that you can't chop ice at all with these aluminum shovels. One wouldn't expect to be able to chop much ice with them, mind you. But the fact is that you will actually damage the product in just 15 minutes if you use it to break the ice in your driveway. In the process of testing this aluminum snow shovel, some ice chopping was done with it, just to see if it would hold up at all. The result: Within 15 minutes, the wear strip started to become disengaged from the blade in the spaces between the rivets. Invest in an ice chopper as a complementary tool if you plan on using this aluminum model from Ames. You try backing out of the driveway next morning without shoveling. The car skids into a snowbank and "bottoms out." You cannot remove the packed snow under the car with your plastic shovel, so you give it a shot with your aluminum snow shovel. Your aluminum product slices right through the packed snow.